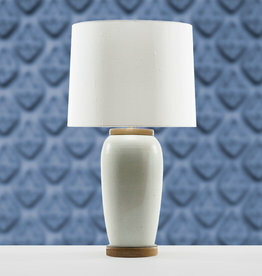 Globally inspired luxury Porcelain Table Lamps by Lawrence & Scott. Unmatched level of craftsmanship combined with solid engineering, our table lamps add a final statement to a comfortable and elegant room. The new Holden lamp by Lawrence & Scott combines our tradition of impeccable craftsmanship with a modern, minimalist silhouette. So familiar, timeless, yet refreshingly modern, the Luca lamp embodies both warmth and excitement. This Living Coral colored Luca is a one-off special edition to honor the Pantone Color of the Year for 2019. There will only be one.